Debbi Tehrani, CSI Mastermind, has found another intriguing Scene for us to investigate this week - from this inspiration image Debbi draws the colours, ideas for design elements and prompts for journaling. 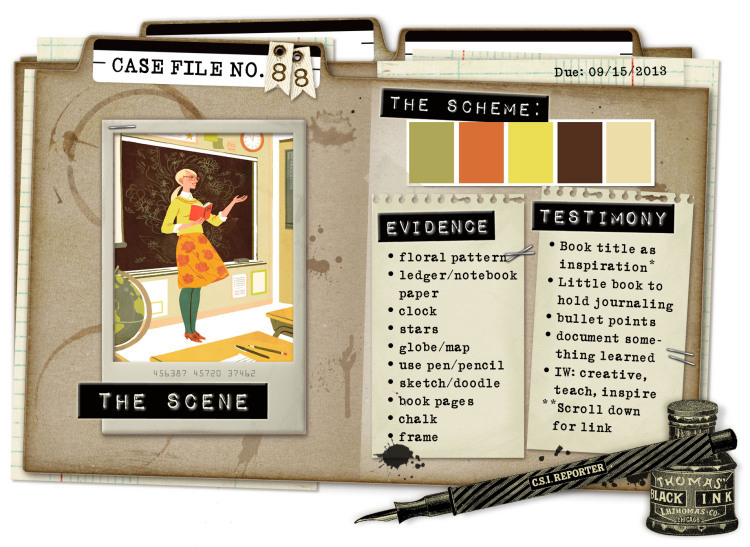 CSI = Color, Stories, Inspiration! 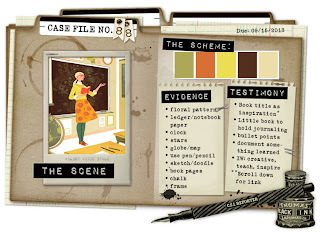 There is also a new set of CSI Coordinates for each Case File - these are printable images, words, journaling spots and patterned papers designed by the fabulous Michele Singh, which CSI members can download for free. Is that brilliant or wot?! The Scheme: I used all the colours. Evidence: ledger paper; clock; stars; map; pen; book pages; frames. Testimony: I made a little book to hold my journaling and entitled it "Tiny Tom 1983". The pages inside read, "Tom, I have watched you grow, from the little scrap you see here into the amazing young man that you have become. You've been through so much to get to this point and I am so proud of the kind of person you are and of what you have achieved, but when I look at you, I still see this cute little face - you will always be my little Tom. I love you. Mum x <3 x"
Clock - a Tando Creative Chipboard shape which I coloured with various Distress Inks. Stars - there are three star stickers dotted about the page, because Tom's a star. Map - as luck would have it, this pp is printed with a map of the London area where Tom lives now. Pen - black and white pens were used to create the faux stitching around the edge of the page. Book Pages - the book cover and pages behind the photo were cut from one 12"x12" sheet. Frames - the photos were double-mounted to frame them. And last, but not least, here is a picture of my little boy as he is today - see? He hasn't changed a bit! Awe, happy birthday to your little Tom!! I LOVE that tiny picture and your page is just wonderful. Time DOES go by so fast, right?